State Department of helps correct EU mistruths about U.S. farms by inviting journalists to Virginia farm. *Travis Coberly is a foreign service officer in the Office of Agricultural Policy at the U.S. Department of State. At first glance, there didn't seem to be much to distinguish Keenbell Farm from any other farm in the region. Cows with their new calves grazed contentedly in the pasture. The comforting smell of diesel and grease permeated the shop. A couple of farm dogs lazily warmed themselves in the late-winter sun. It could have been Anyfarm, U.S.A., really. But over by an enclosed part of the equipment shed, converted into a small store and painted barn red, something unusual was happening. CJ Isbell recently invited several EU journalists to his farm to help them experience a true inside look at U.S. agriculture that may not fit the typical view of industrialized American farms. Sprouting an array of microphones and jabbing furiously in notebooks, a group of 13 European journalists was listening intently to CJ Isbell explain what it is that makes Keenbell Farm unique and what he and farmers like him are doing to redefine American agriculture. With a little help from the journalists and the U.S. Department of State, Isbell and Keenbell Farm are helping change European views about American agriculture. U.S. and European Union officials recently concluded round 12 of negotiations for the Transatlantic Trade & Investment Partnership (TTIP) and are determined to reach an agreement by the end of the year. Many obstacles remain to a final agreement, however, including a deal on agriculture — a subject that has been and will remain controversial. Although the agriculture negotiations cover a huge range of issues, from tariffs to export certificates, it is the more emotional subjects such as biotechnology, animal welfare and food safety regulations that receive the most coverage. Those difficult issues are also subject to the most misinformation. A mix of highly charged emotion and a lack of reliable information have turned some Europeans against the deal. That's where the U.S. Department of State can help. The department sponsors multiple programs for educational, cultural and professional exchanges across the world. One of these is the foreign reporting tour. Organized by the Foreign Press Centers, these tours bring influential journalists to the U.S. to cover stories of mutual interest. The journalists spend up to two weeks stateside, where they meet with everyone from U.S. officials and corporate executives to average citizens and local volunteers. 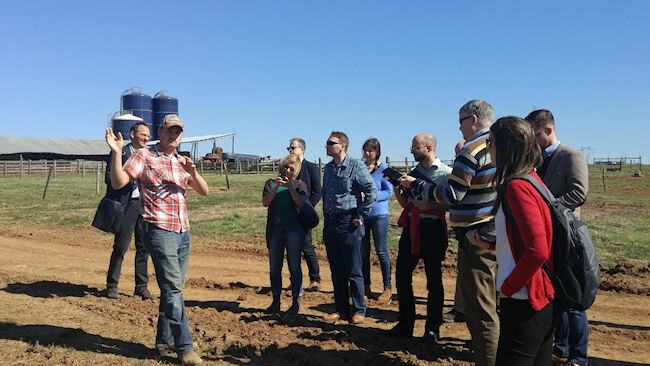 That's how a group of European journalists ended up in front of Isbell's shed, listening as he expounded upon the growth in demand for local food, the challenges of raising pigs on pasture and his philosophy on soil health and land management. The journalists were on a program to help them better understand the U.S. approach to TTIP. They started their agenda the week before in Brussels, Belgium, observing TTIP negotiations. The second part of the program brought them to Washington, D.C., for meetings with government officials, followed by the final leg in New Orleans, La., to learn more about the impact of international trade on the region. The journalists were not exclusively covering agricultural issues, but agriculture did make up a significant part of the program. Thanks, in great part, to the proliferation of misinformation, many Europeans have developed a negative stereotype of American agriculture as a monolithic industry consisting of large, industrial farms beholden to large corporations and completely indifferent to animal welfare and the sustainability of the land. Isbell and Keenbell Farm helped shatter these myths. A third-generation farm located in the rolling, wooded hills of Hanover County, Va., Keenbell Farm began as a conventional farm in 1951 under Isbell's grandfather. The farm, like many throughout the country, suffered during the farm crisis of the 1980s and was almost relegated to a hobby farm before a 20-year-old Isbell decided to revive the family farming business in 2005. As many young farmers have discovered, however, breaking into farming can be a challenge. “We started our operation with $250 and a heifer,” Isbell recalled. He knew he needed a different approach, so Isbell did his research. Like a good businessman, he looked around and asked himself what people were lacking and how he could supply that need. What he found was a small but growing group of local consumers who wanted a better connection to the food they feed their families. Isbell became that connection. “Our customers want to be able to shake hands. They want make a relationship,” he explained. Although Keenbell Farm is not certified organic, Isbell ensures that production is in line with natural and organic standards. The farm maintains a store on site and markets to a number of local grocery stores, private buyers and farmers markets. The EU journalists, at least, seemed impressed. Standing in his boots, pearl-snap shirt and Case IH hat, Isbell looked every bit the stereotypical American farmer, but any thoughts about future hayseed jokes quickly disappeared when Isbell began to explain the science behind the farm's philosophy and the extent of its marketing. It was clear that Isbell is not only passionate about his business but extremely knowledgeable and innovative as well. What emerged was the portrait of a man who is a farmer, of course, but who is, even more, an entrepreneur. Isbell summed up the essence of American agriculture. Far from being the soulless food factories that many Europeans believe them to be, American farms are diverse and sustainable, and American farmers are preparing to meet the challenges of the future in innovative new ways.